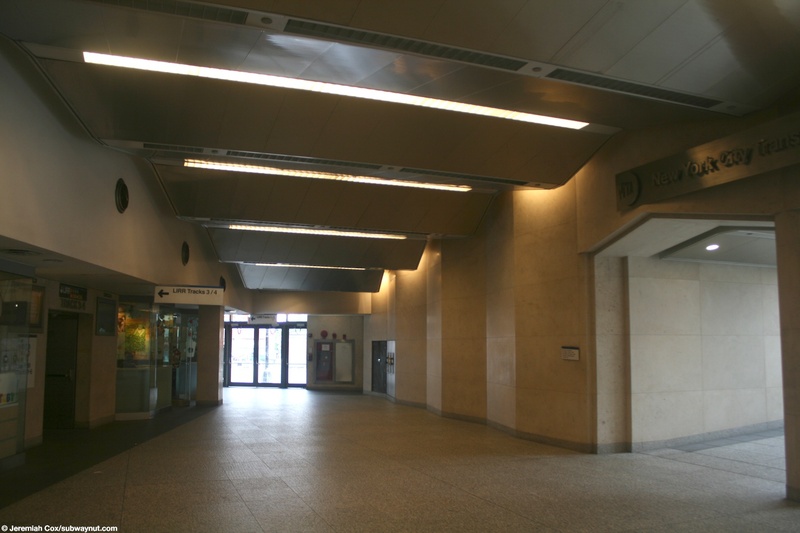 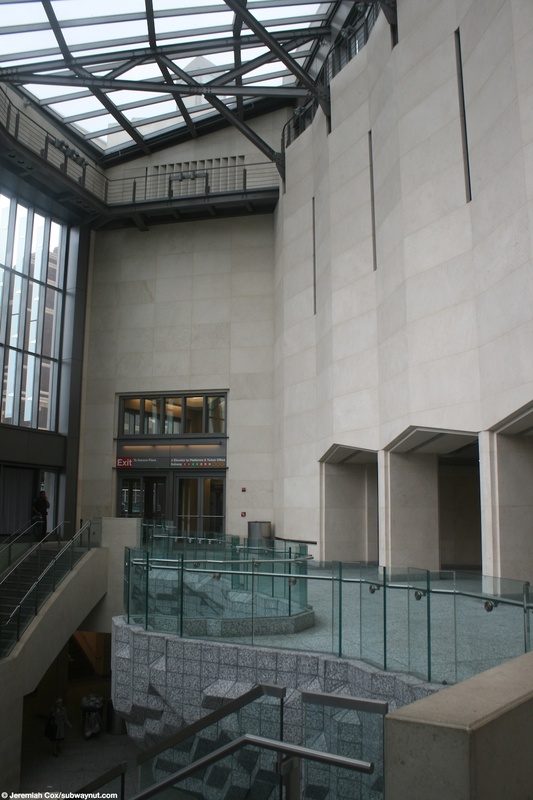 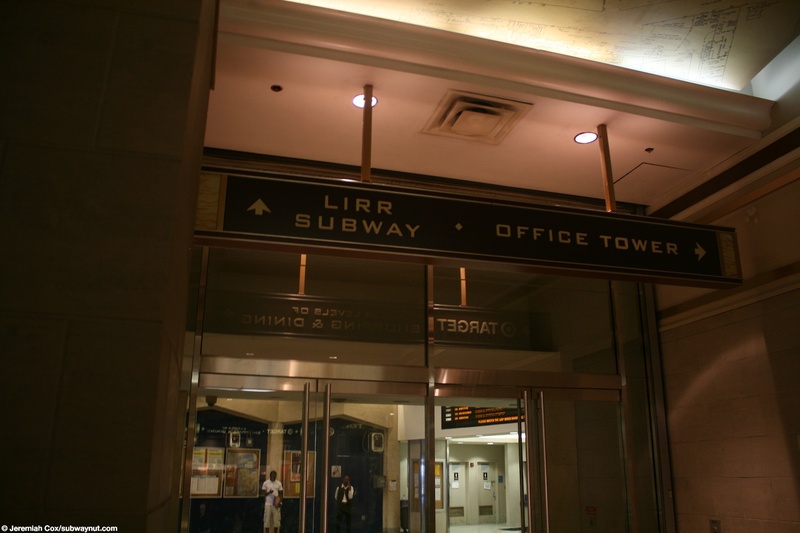 Two main staircases in the atrium and an elevator (that is one of two ADA elevators into the Subway station in addition to a street elevator at Pacific Street) lead down to the underground (but lit by light from modern atrium) concourse where there is a direct entrance to the subway and the Manhattan-bound (2,3) IRT Local platform (use for other subway lines) and a passageway up a few steps to an entrance to the Brighton BMT (B,Q) platform. 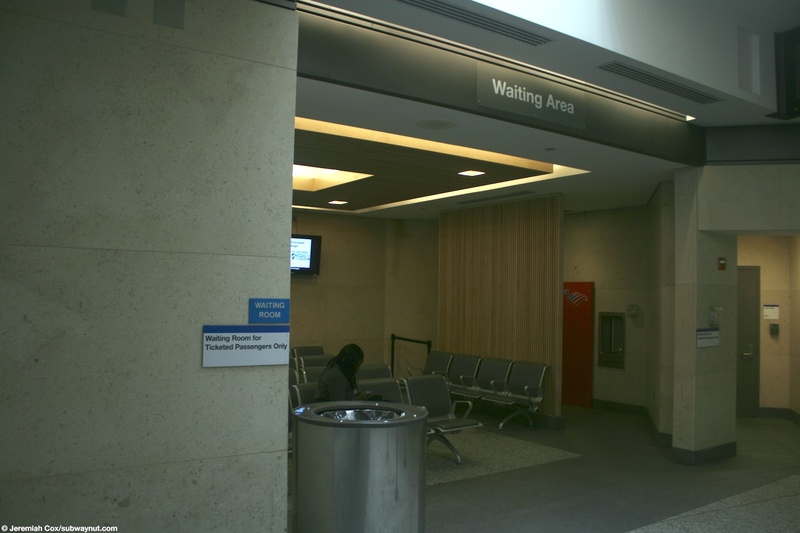 There is also a small waiting room with modern benches, restrooms, and 4 ticket windows (3 were open when I visited in October 2012 during the PM rush hour). 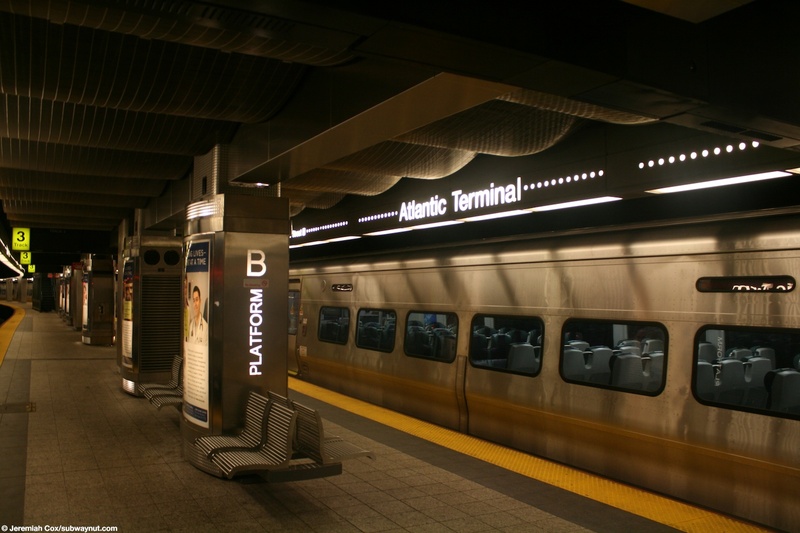 The waiting room leads out to the end beyond the bumper blocks of three LIRR island platforms that serve for the six tracks. 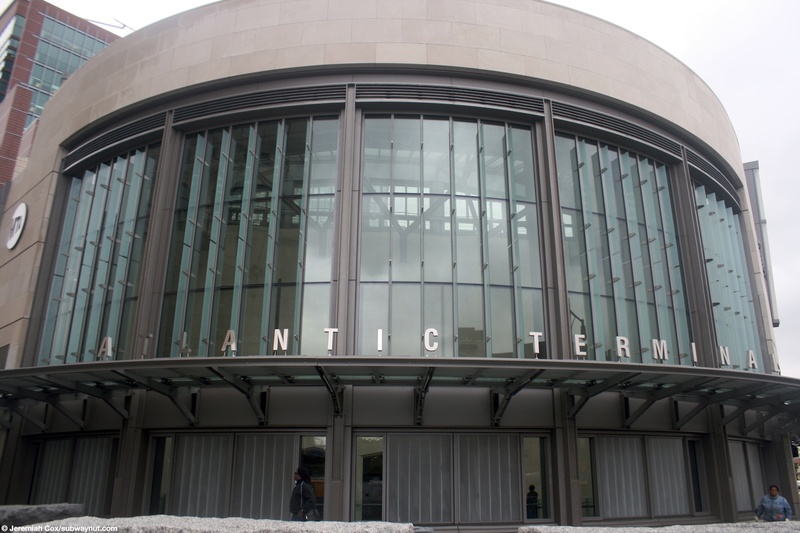 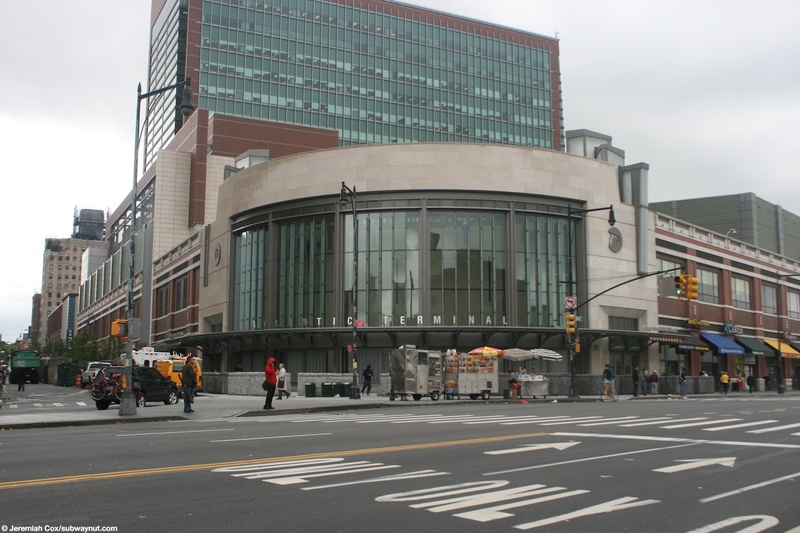 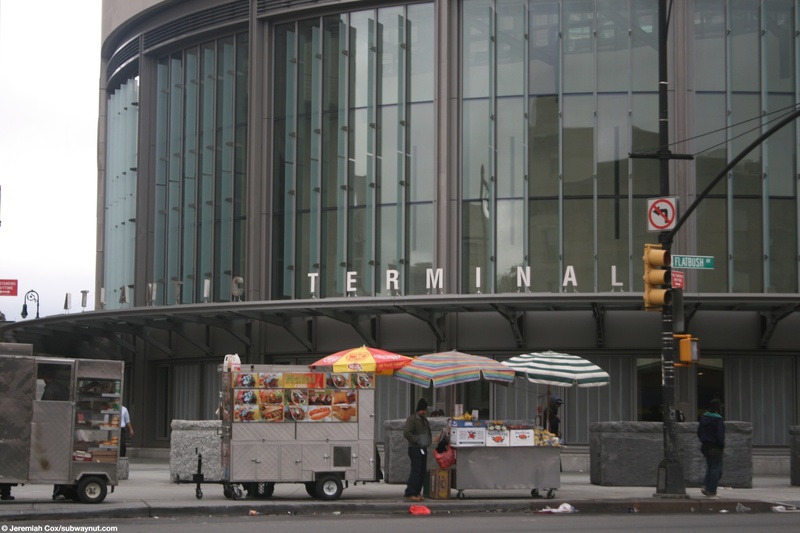 These were recently renovated with lighted signs that say Atlantic Terminal along both platforms. 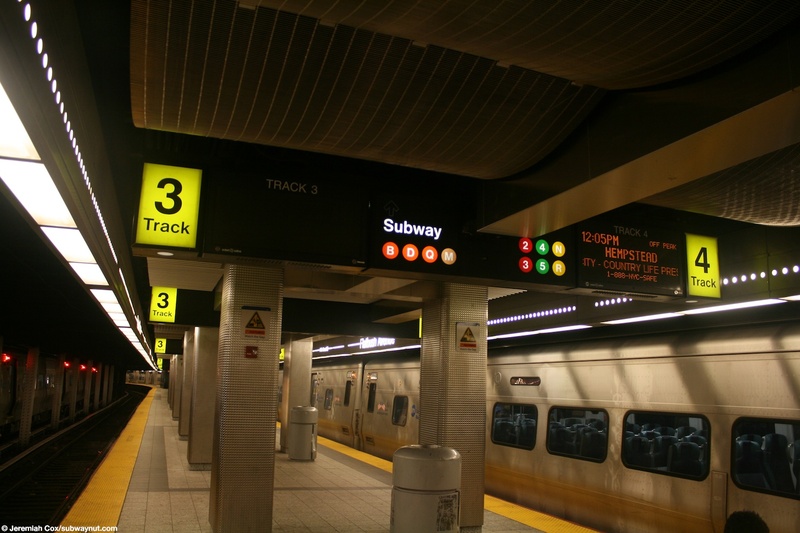 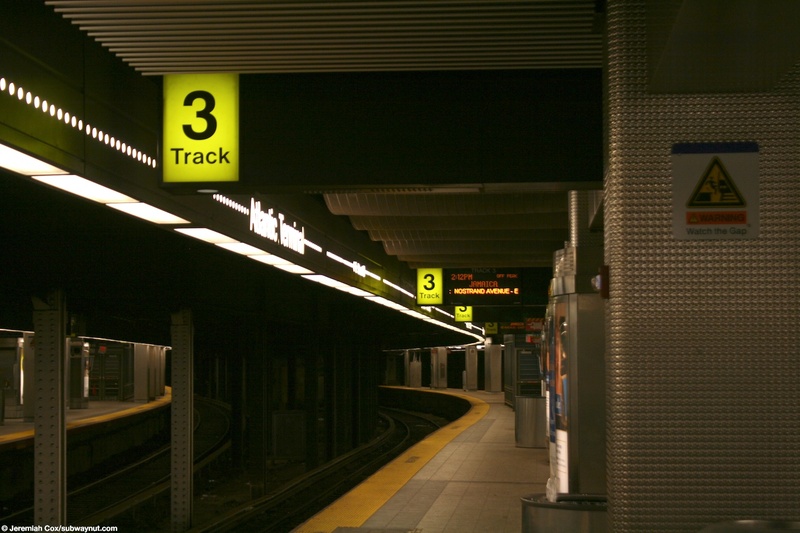 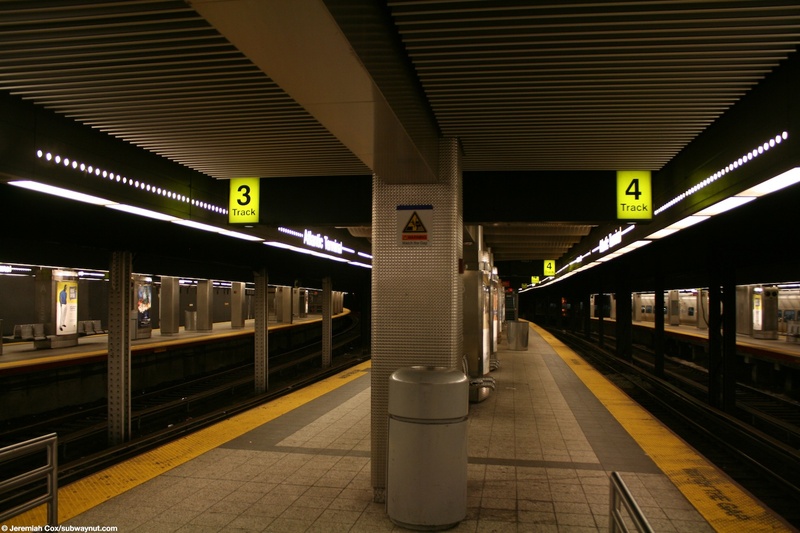 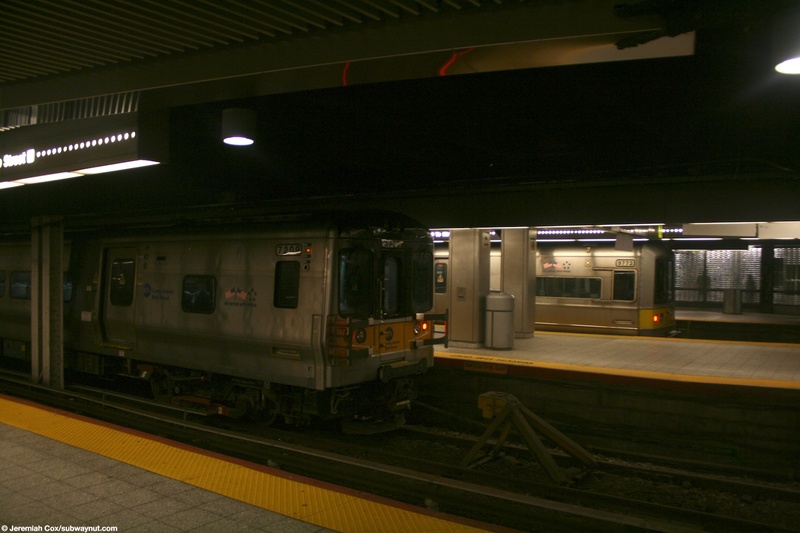 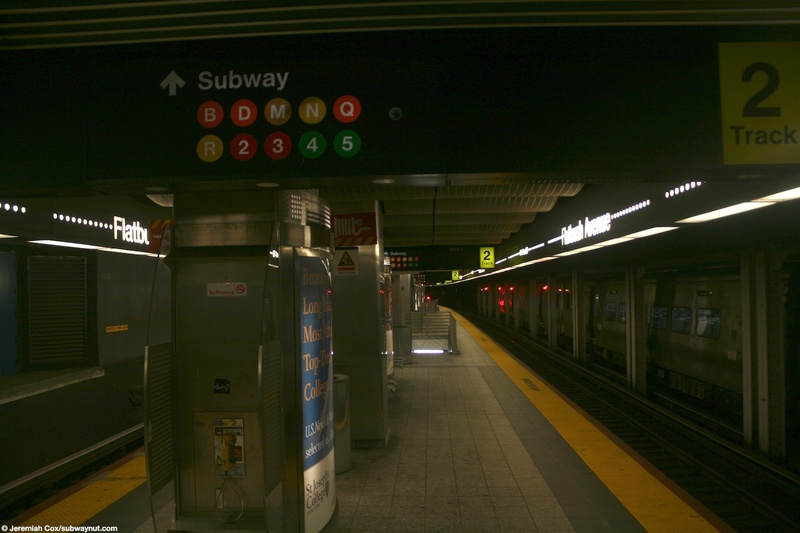 Track 6 is far shorter than the rest of the tracks because that platform ends early to allow space for the direct IRT Manhattan-bound 2,3 subway entrance. 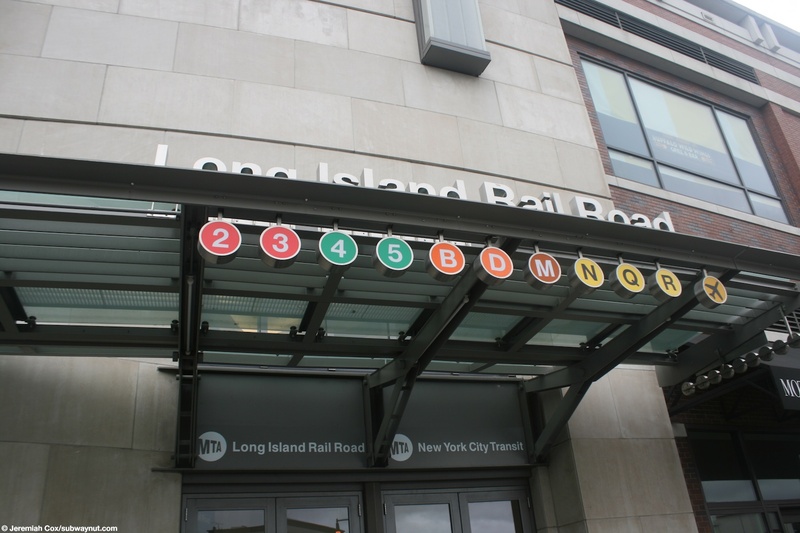 There are also little glass opaque cubes from the subway station to the LIRR platforms. 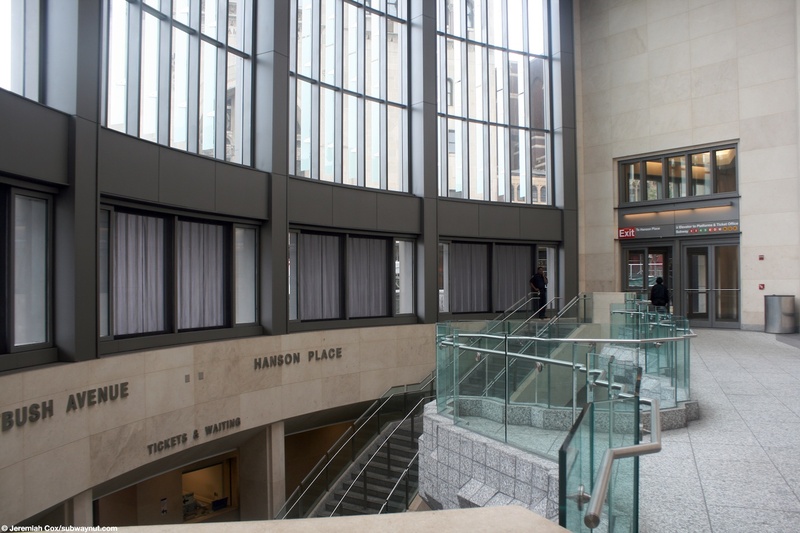 Each platform has an additional staircase down to it from the street level floor of the entrance pavillion, near the Atlantic Center end. 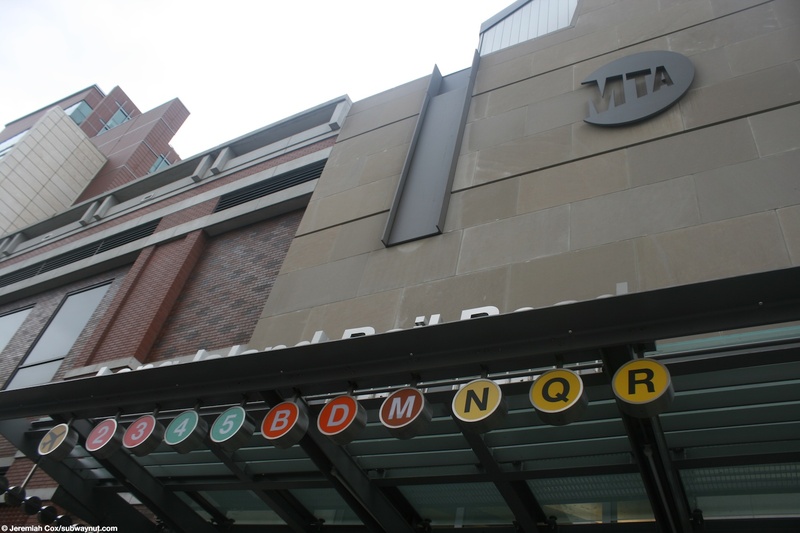 All three platforms also have staircases up from the subway passageway that connects the BMT Brighton Line B,Q platform to the IRT Brooklyn 2,3,4,5 platforms. 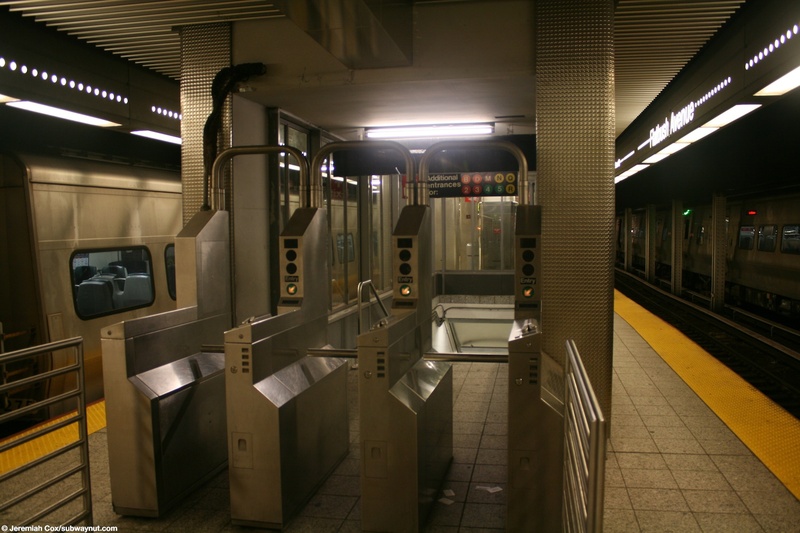 These staircases each end in a bank of subway turnstiles directly on the LIRR platform for tracks 3,4,5, and 6. 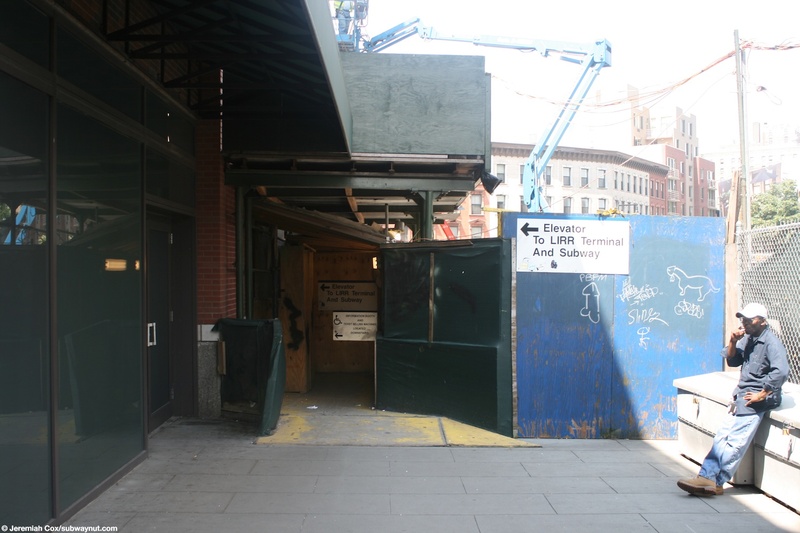 The staircase for tracks 1 and 2 leads down to two high entrance turnstiles next to an MVM. 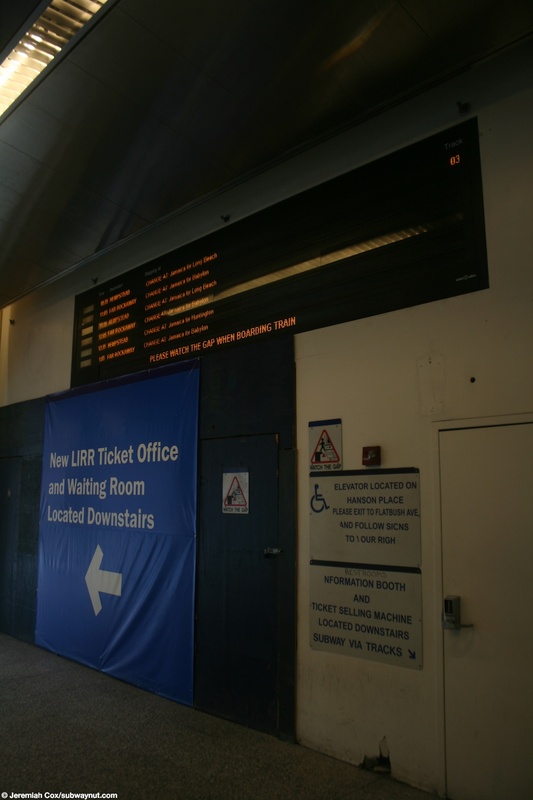 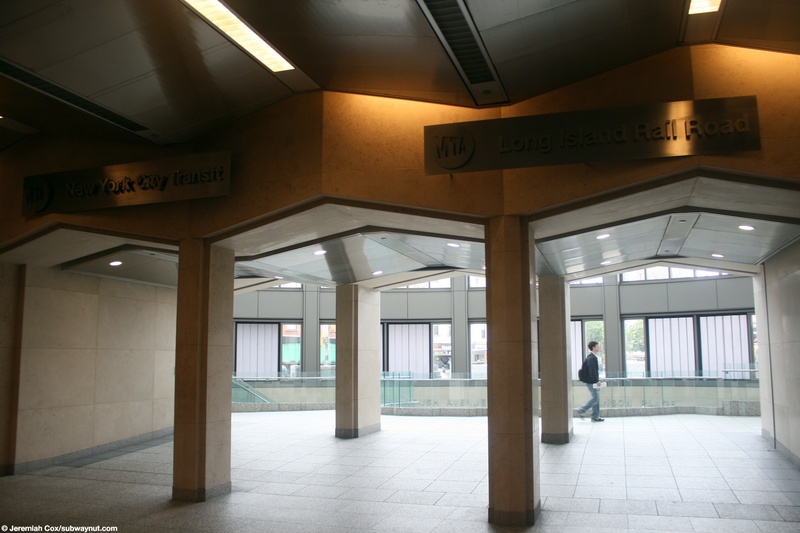 There are even LIRR track information signs along this connecting passageway within the subway station, so transferring passengers can leave the subway system at the right staircase to catch their trains.